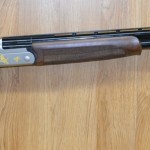 WW GREENER 12 Bore Imperial Grade Boxlock Ejector. Fully engraved with beautifully executed foliate scrolls and game scenes. More information and pics to be added at a later date, thanks.